ecoLincNZ: A really lousy day! Do the louse have any benefits for their host? If they were freed of lice would their immune systems go haywire? As far as we know there are no particular benefits. 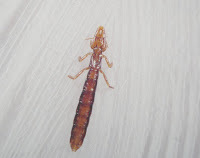 The lice don't cause major issues for the hosts either (although the extra preening that they do does make potential mates less likely to select them).